Three years after a statue was stolen in Bermondsey, the replacement has been unveiled along with another newly commissioned statue. As we reported in 2011, the bronze statue of Dr Alfred Salter was stolen, presumably by metal thieves for scrap. Alfred and his wife, Ada, were famous for their community work in the slums of Bermondsey in the early 1900s. Alfred was known for bringing free medical care to those who needed it, before the NHS. Ada became Mayor of Bermondsey in 1922, making her the first female London mayor. The new statues of Alfred and Ada sit alongside an already existing statue of Alfred and Ada's daughter, Joyce, and her cat. 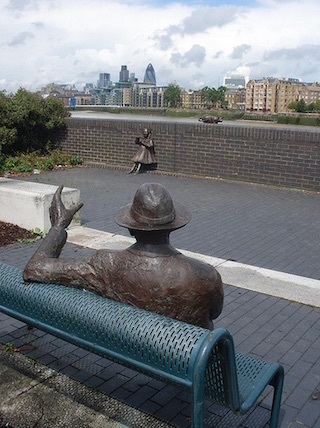 Joyce died aged nine of scarlet fever, and the original statue configuration showed Alfred watching his daughter playing. Since the original statue was stolen, The Salter Statues Campaign has been fundraising for the new ones, and managed to raise £60,000 for the statues and for CCTV to protect them. Southwark Council matched the £60,000 raised through the campaign. Diane Gorvin, the artist who created the original Alfred Salter statue in 1991, was commissioned to create the new pair.